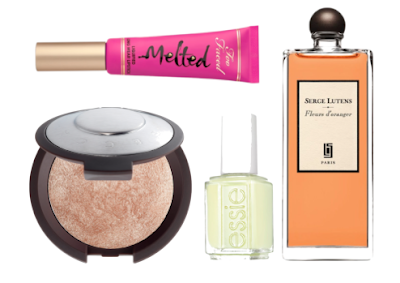 Just popping by to share my current beauty wishlist. We are back from France and adjusting to being home again. Jet lag isn't too bad and even the baby seems to be doing okay with the time difference. Let's hope it sticks! These are the beauties I'm eyeing: a Melted lipstick by Too Faced, Serge Lutens' Fleurs d'Oranger eau de parfum, Becca Shimmering Skin Perfector, Essie Chilato nail polish.